Five cans containing "potentially corrosive" liquid have washed up on a beach on the Isle of Wight. 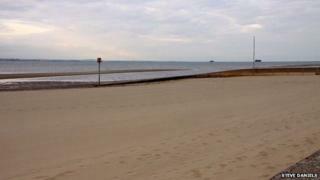 They were removed from Ryde beach by the fire service using a specialist trailer for safe disposal. Isle of Wight Council is working with the fire service, the coastguard and police following the discovery of the green 25-litre containers. People are advised not to touch the containers if more wash up but report their location to the council.